Sim Lim Square Scammed Vietnamese Tourist Says: "I Will Not Accept Anymore Help"
This post appeared first on Vulcan Post. Vulcan Post is a digital lifestyle publication for the Generation Y. Like us on Facebook to keep up to date with our latest news and articles! Efforts to help a Vietnamese tourist who was scammed by a local store in Sim Lim Square has taken an unexpected turn. The Indiegogo Campaign set up by Singaporean entrepreneur, Gabriel Kang, has raised a whooping USD$11,500, almost S$15,000, in support for Mr Pham, who was on a holiday in Singapore with his girlfriend when the incident happened. Kang has updated the campaign, thanking supporters, and stating his intent to use the extra money to give Mr Pham and his girlfriend an all expenses paid holiday in Singapore, and let them “enjoy the dream holiday that was stolen from them”. He also raised another recent incident of a 19-year-old undergraduate who was scammed by another store in Sim Lim Square, and pledges to divert resources to help her as well. The campaign was a huge success after a mere three days, exceeding its original goal of USD$1,000 by tenfold. However, Mr Pham had reportedly told Lianhe Zaobao that he has accepted $550 from a businessman, and bought a phone with it. He said he will not be accepting any more help. “I lost $550. So I will accept only $550 donated by kind people. Nothing more. I’m grateful for all your kindness but I do not want to take more than what I’ve lost,” Mr Pham told Lianhe Zaobao. 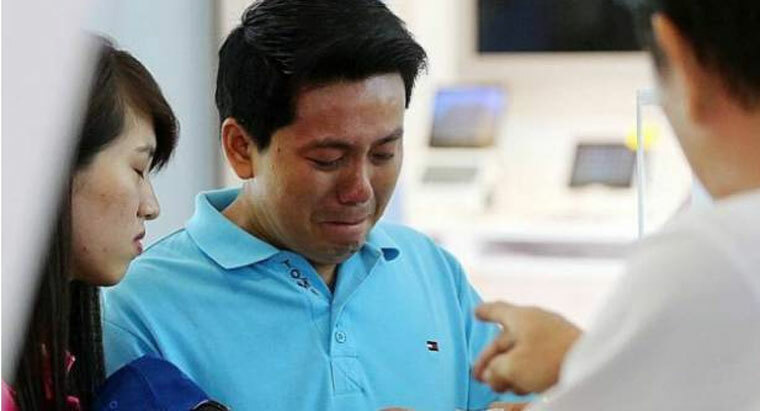 Enraged by the situation, netizens have taken it upon themselves to avenge scammed shoppers like Mr Pham, by exposing the man who had scammed Mr Pham. Jover Chew, store owner of Mobile Air, has become the latest victim of vigilante netizens everywhere. Mobile Air is also the same store that refunded a Chinese tourist in coins, but the viral video of Mr Pham begging on his knees while staff in Mobile Air laughed seems to have been the straw to break the camel’s back. SMRT Ltd (Feedback), a Singapore Facebook group, has banded together to expose Mr Chew. They released several unflattering photos of him, as well as his personal information like home address and phone numbers. This has led to many people playing pranks, like sending exhorbitant pizza orders to his house and stalking his house. SGag has also delivered a T-shirt with vulgarities on it to his store, to await his arrival. The Indiegogo campaign is still open, and will be until Nov 12. If the campaign continues to accept money, and Mr Pham does not accept any help, then what will happen to all the $15,000 already raised?